In my head, The Black Penny is one of a new crop of London coffee shops which I am slowly getting around to visiting. The reality is that it has been here for a while, having recently celebrated its third birthday. I guess the emphasis in the first sentence really should be on “slowly”. The Black Penny occupies the site of another London stalwart, Salt, which closed at the end of 2013, which might explain why I still think of it as new, long after it has become an established fixture in London’s coffee scene. Perhaps as well known for its all-day brunch menu as its coffee, The Black Penny occupies a long, thin space, with a magnificent back room providing additional seating. There’s a bespoke house-blend on espresso, plus a single-origin on V60, both roasted for The Black Penny by The Roastery Department, the coffee-roasting arm of the Department of Coffee & Social Affairs. During the week, there are salads at lunchtime, while there’s cake available through the day, seven days a week. For those that are so inclined, there’s a small selection of wine and beer, as well as an excellent range of soft drinks, plus tea. The Black Penny is just off Drury Lane on Great Queen Street, opposite the Freemasons’ Hall. One of a row of shops, pubs and restaurants, you could easily walk past if you didn’t know it was there, the modest exterior blending in with the surroundings. The Black Penny occupies the ground floor of one of a row of old brick-built buildings that just ooze character. The black-framed exterior has a single, large picture window on left, with a glass door on the right. There are four two-person tables outside on the pavement, sheltering under a black awning which acts as either an umbrella or a sun-shade, depending on the weather. Inside, the building, which once housed a diamond merchant and still has the massive safe door to prove it, is long and thin, with wooden floorboards and exposed brick walls. Although there’s plenty of natural light, it has perhaps the highest density of light-bulbs I’ve ever seen in a coffee shop. When it comes to seating, a four-person bar runs the full width of the window at the front, while a pair of four-person bars provide additional seating against the right-hand wall. The left-hand side, meanwhile, is occupied by a large counter which zig-zags its way from front to back. The first of the four-person bars is towards the front, while the second is right at the back, next to a tall window in the back wall. If you’re ordering takeaway, you need go no further than first of these two bars, where you can order and wait for your coffee, while if you’re sitting in, the staff will attempt to intercept you and guide you to a seat, where you’ll be handed a menu. Even better, if you’re eating, the chances are you’ll be led down the tall, narrow passageway that extends from the back of The Black Penny and down a couple of steps into the magnificent back room. This large room more than doubles the available seating. Even better, it has wonderfully high ceilings, complete with skylights, giving it a wonderful sense of space, and extends off to the right, providing The Black Penny with much needed width. A long communal table with benches on either side lines the front wall, while eight two-person tables line the left-hand and back walls, each with four tables. The Black Penny offers a classic all-day brunch menu, which, I must say, looked very tempting. However, the kitchen closes at five o’clock and, displaying my legendary timing, I arrived at 5:15, so had to settle for a cake to go with my coffee, picking the sticky date muffin. This was a rich, dense cake, but wasn’t as sticky as I expected (I was envisaging more of a sticky toffee pudding in muffin form). When it comes to coffee, there’s a choice of the usual espresso-based drinks or a seasonal single-origin which is available through the V60 and is served in a carafe with a cup on the side. During my visit, this was an Ethiopian Chucho Grade 1. However, I was tempted by the Cicciolina Espresso, a blend of beans from Burundi and Colombia, which I had as an espresso. One of the more interesting coffees that I’ve experienced, it had a rich, complex taste and plenty of acidity. 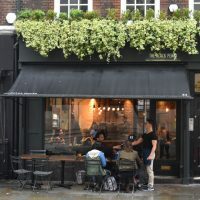 This entry was posted in Breakfast, Cafes, Cake, Central London (West), Coffee & Beer, Coffee & Wine, Laptop Friendly, Lunch and tagged Dept Coffee, include by Brian Williams. Bookmark the permalink.